revealed in the mysteries of the Incarnation and Redemption. St Thérèse of the Child Jesus and the Holy Face, Patroness of all Missionaries and the Missions, Patroness of France and Doctor of the Church was born in Alençon on 2 January 1873 the last of the nine children born to St Louis and St Zélie Martin. She was christened Marie-Françoise-Thérèse in the Church, now the Basilica of Notre Dame in Alençon. Four of the Martin children died before Thérèse was born - Joseph Louis, Joseph-Jean-Baptiste and Mélanie-Thérèse died in infancy and Hélène died when she was five. Thérèse and three of her surviving sisters Marie, Pauline and Céline became Carmelite nuns in Lisieux in Normandy a geographical region in the north-west of France. Her fourth sister Léonie entered the Visitation Convent in Caen also in Normandy. Her parents Louis and Zélie were beatified in October 2008 and were canonised in October 2015. Their feast day is celebrated on 12 July. The Cause of the Beatification and Canonisation of her sister Léonie - the Servant of God Sr Françoise-Thérèse was announced by the Bishop of Bayeux and Lisieux on 2 July 2015. When Thérèse was only four years old her mother died. After this the family moved to Les Buissonnets in Lisieux, the home where St Thérèse then lived – and described as ‘the gracious nest of my childhood’ - until her entry to the Lisieux Carmel in 1888. It was in Les Buissonnets in 1883 that Thérèse was cured through the smile of the Blessed Virgin Mary of a mysterious illness which had left her seriously ill. It was also here that she received the Grace of Conversion, after midnight Mass on 25 December 1886, about which she wrote in her autobiography ‘I felt charity enter into my soul, and the need to forget myself and to please others’. From an early age Thérèse wanted to give herself to God; she wrote that ‘from the age of three, I began to refuse nothing of what God asked of me’; she described Céline’s First Holy Communion as ‘one of the most beautiful days of my life’; she became a Child of Mary; she attended daily Mass with her father in the Cathedral of St Pierre in Lisieux. In May 1887 when she was fourteen she asked for and got her father’s permission to enter Carmel. Later that year she travelled with her father and her sister Céline to Rome where she asked Pope Leo XIII for his permission to enter Carmel at the age of fifteen. 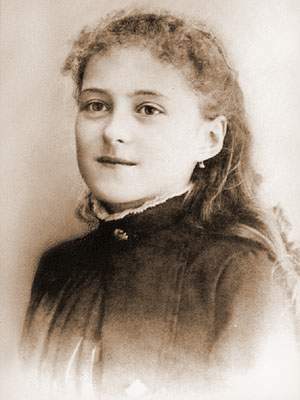 Thérèse entered the Lisieux Carmel on 9 April 1888 and was professed on 8 September 1890. As a Carmelite nun Sr Thérèse of the Child Jesus and the Holy Face devoted her life to God. She became a Carmelite ‘to save souls and especially to pray for priests’. She lived to a large extent in silence and continual prayer and engaged in the work and recreations of the community. There is a lot of detail - as recorded in St Thérèse of Lisieux: Her Last Conversations – in Thérèse’s reply to Mother Agnes’ query about her various assignments in the Carmel. She was initially assigned to the linen room and the refectory and later became assistant sacristan and was placed in charge of the novices in 1893. She undertook sewing, gardening, painting of religious objects and was a prolific writer. All the writings of St Thérèse are infused with reference to God and scripture and with prayerfulness. Her works include religious plays, poems, specific prayers, hundreds of letters from before and after her entry to Carmel and providentially her autobiography Story of a Soul in which she articulated her Little Way of Spirituality and her Doctrine of Love. On prayer St Thérèse wrote: ‘For me prayer is an aspiration of the heart, it is a simple glance directed to heaven, it is a cry of gratitude and love in the midst of trial, as well as joy; finally, it is something great, supernatural which expands my soul and unites me to Jesus’. In 1895 St Thérèse made her Act of Oblation to Merciful Love. St Thérèse became ill in 1896 and died, with great suffering, from tuberculosis less than two years later. During this time she also suffered a trial of faith and hope which she offered so that ‘the bright flame of faith’ can shine for those who do not believe. Towards the end of her life St Thérèse said she realized that her mission was about to begin, and she vowed to spend her heaven doing good on earth. She died on 30 September 1897 and was buried in the Lisieux Cemetery on 4 October 1897. On 30 September 1898 a year after the death of St Thérèse 2000 copies of her autobiography l’Histoire d’Une Âme (Story of a Soul) were printed. They were sold out in less than a year and more were printed. Over time the inspirational writing of St Thérèse became a bestseller worldwide and was translated into numerous languages. 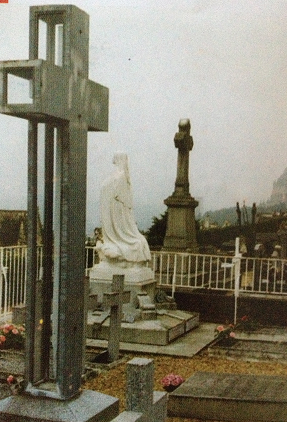 After the publication of her autobiography and the spread of devotion to St Thérèse many miracles were attributed to her and her grave in the Lisieux Cemetery became a place of pilgrimage. The Diocesan Process for the Beatification of Sr Thérèse of the Child Jesus began in 1910. That year St Thérèse’s body was first exhumed and then reburied in a new vault in the Lisieux Cemetery. In June 1914 Pope Pius X signed the Decree for the Introduction of the Cause for the Beatification of Sr Thérèse of the Child Jesus. The Decree of Approbation of her Writings was issued in Rome at the end of that year and was followed by the opening of the Apostolic Process for the Beatification in Bayeux in 1915. Her four sisters met - as religious - in the Lisieux Carmel during the Process and gave witness into her ‘writings, her life and her virtues’. Sr Thérèse of the Child Jesus and the Holy Face. A second exhumation for formal identification took place in 1917 and was again followed by reburial in the Lisieux Cemetery. In 1921 Pope Benedict XV promulgated the Decree on the Heroicity of the Virtues of the Venerable Servant of God, Sr Thérèse of the Child Jesus. In March 1923 the body of the then Venerable Servant of God was brought to the Lisieux Carmel in advance of her beatification by Pope Pius XI in April 1923. Her canonisation by Pope Pius XI followed in 1925. Today there is a constant stream of visitors and pilgrims to the Shrine of St Thérèse in the Lisieux. The Universal Feast Day of St Thérèse is celebrated on 1 October. 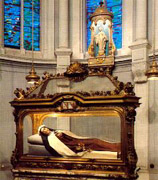 The Shrine features the well-known reclining figure - in the habit of the Carmelite Order - which represents St Thérèse at her death and is the place of the major reliquary of St Thérèse. The original statue of the Virgin of the Smile - to whom St Thérèse prayed during her childhood illness - is located high above the shrine. St Thérèse’s three sisters (Marie, Pauline and Céline) who as Carmelites were known respectively as Sr Marie of the Sacred Heart, Mother Agnes of Jesus and Sr Geneviève of the Holy Face are buried nearby in the side wall of the Chapel. 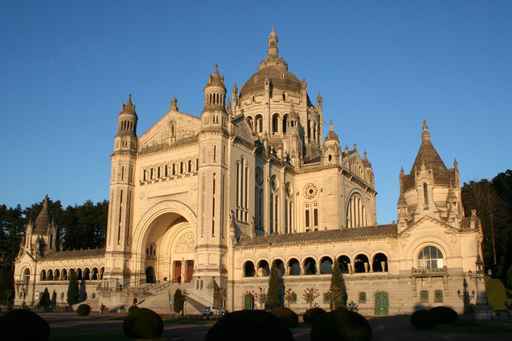 The Basilica of St Thérèse in Lisieux was consecrated in 1954. At the time Pope Pius XII donated a Reliquary to the Basilica and requested that the right arm and hand of St Thérèse with which she had written Story of a Soul, be permanently venerated there. 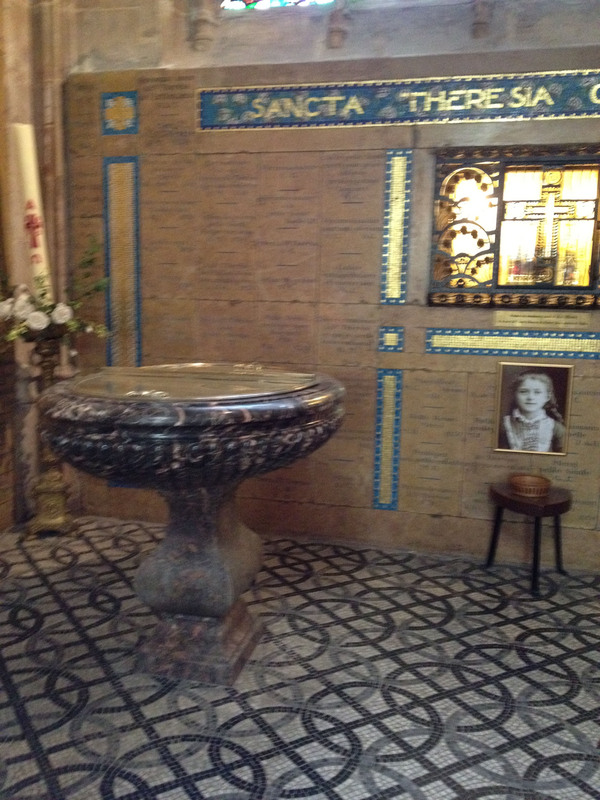 The tomb of St Thérèse's parents Saints Louis and Zélie is now in the crypt under the Basilica. Down the years the popes have endorsed the message of St Thérèse: Pope Pius X introduced her cause in 1914; between 1923 and 1927 Pope Pius XI beatified, canonised and declared Thérèse Patroness of Missionaries and the Missions and spoke of her as the star of his pontificate; Pope Pius XII proclaimed her Patroness of France and at the time of the consecration of the Basilica of St Thérèse in Lisieux in 1954 remarked that St Thérèse penetrated to the very heart of the Gospel; Pope Paul VI 'offered her as a teacher of prayer and theological virtue of hope, and a model of communion with the Church, calling the attention of teachers, educators, pastors and theologians themselves to the study of her doctrine'; On Mission Sunday 19 October 1997 - the year of the hundredth anniversary of her death - St Thérèse was proclaimed a Doctor of the Universal Church by Pope John Paul II in recognition of the wisdom of her doctrine of love in the Church, her holiness and the worldwide dissemination of her message through her writings.